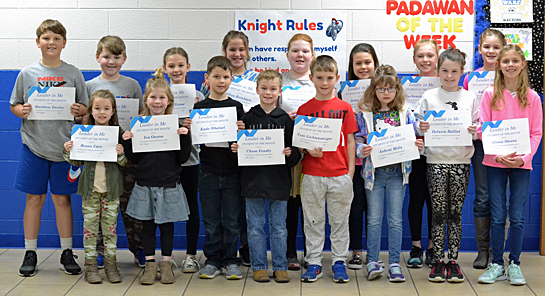 Crestview Elementary recently named its “Leader in Me” students of the month for showing the habit of “Balance” in March. All students were asked to focus on taking care of their bodies, learning outside of school, and helping others. The Student of the Month program is sponsored by R&G Sports. Award winners included (front row, from the left) Brynn Carr, Iva Owens, Kade Whetsel, Chase Feasby, Tate Lichtensteiger, Aubree Mills, Delanie Balliet, and Alison Owens; (back row) Matthew Dealey, Drew Tracey, Graylie Grose, Eliza Reinhart, Breanna Shellabarger, Jetta Merkle, Mackenzie Harting, Adelle Crisp.